J. J. Johnson was the early bop pioneer on trombone working and recording with the greats of the genre including Charlie Parker and Dizzy Gillespie, later working and recording within small groups and the big band format. This album contains two complete LPs which are poles apart in style but represent two sides of the work of J. J. Johnson The first finds J. J. in a quartet format playing tunes from the pen of Kurt Weill from the album “J. J. Johnson plays Mack The Knife”. The accompanying trio have worked and recorded together on many occasions and a well integrated unit. Although pianist Andre Previn has made his name in the classical field he is a talented jazz pianist and with Red Mitchell on bass and Frank Capp on drums we have a stellar combination. Kurt Weil compositions lend themselves to jazz interpretation and Andre Previn has a successful history of just this type of album such as “My Fair Lady” and “Pal Joey”. “Bilbao Song” has a fairly unconventional intro but rhythm section soon revert to a highly charged groove. 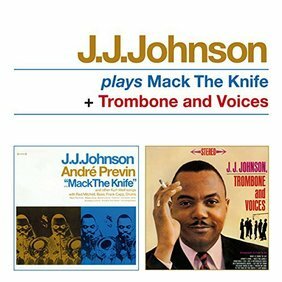 Johnson really hits his stride on “Mac the Knife” producing some hard swinging trombone with Andre Previn not too far behind. Deciding to restrict the music to one particular score does place some restrictions on the eventual outcome of the album but this group with this particularly well. With “Trombone and Voices” we are in completely different territory but there is plenty to admire in the recording. The wordless vocalising by the group can sound like those middle of the road Fifties albums but when they sing the words they can easily mistaken for a vocal of the quality of the Hi- Los. J. J. Johnson’s trombone playing is immaculate throughout. “Get Out Of Town” and “Lazy Bones” are fine examples of the combination of trombone and vocals. On reflection J. J. Johnson’s playing on the “Voices” album is superior to the “Mack the Knife” album this of course could be due to the familiarity of the material. In some ways this album appears to be directed at two different markets but there is much to be gained by listening to two sides of the coin.